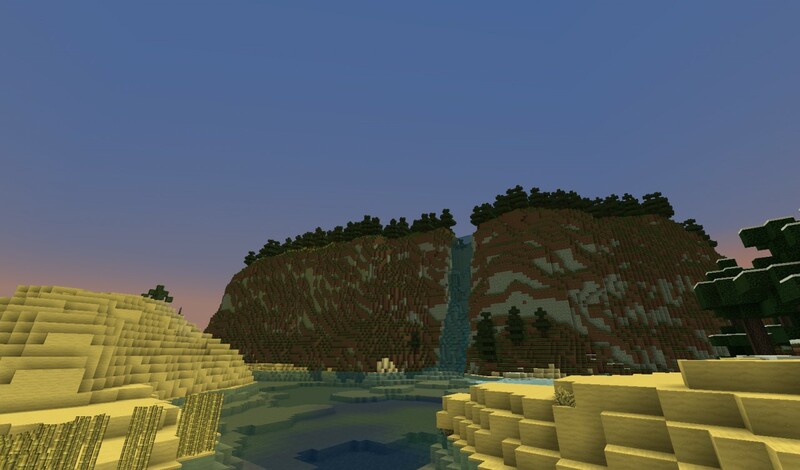 This adventure map will no longer be worked on. It was fun, but it was to much for a first adventure map! the demo will still be downloadable. 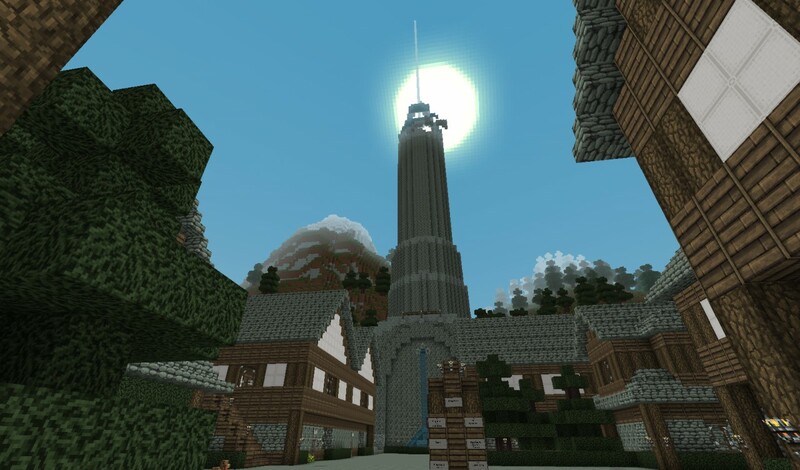 I plan on making a new adventure map soon, stemming off of the story of this one, and maybe continuing on with the current story on a different, more defined map! If you try the demo map, please leave a comment, or send a private message with feedback, as it helps me alot! Thanks! This map is currently only a demo, and is compatible with 1.3. Things will probably be changed from the demo in the future, depending on the feedback! A download is now available! This map was created by me, with a few people giving a small hand, such as aligee97 and WeeGWarrior123. My first ever adventure map will be my biggest project yet. I hope this map works out well, and that when it is released, I hope you enjoy it! 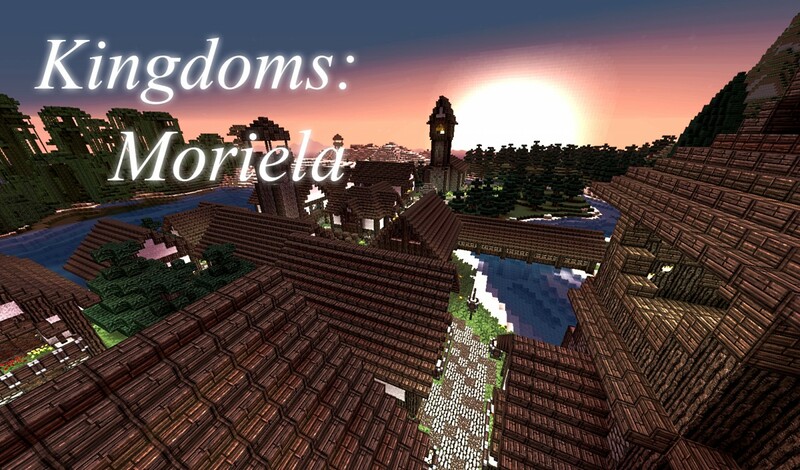 This adventure map will be part of my adventure series "Kingdoms". 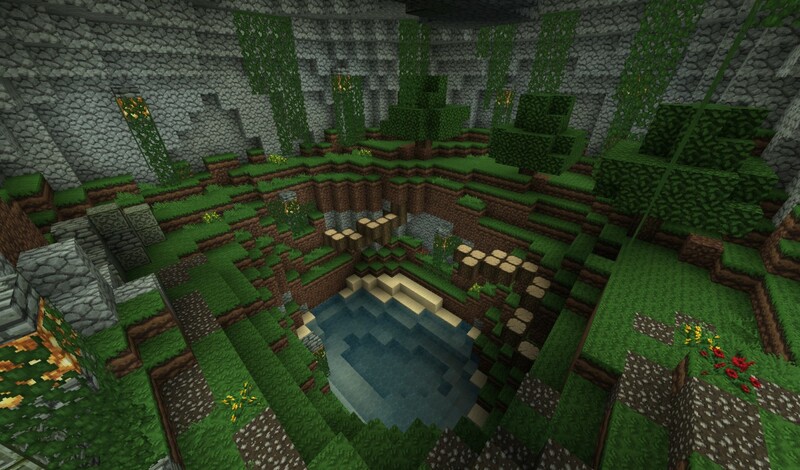 In the future, I want to make more adventure maps, linked to this one, and others. 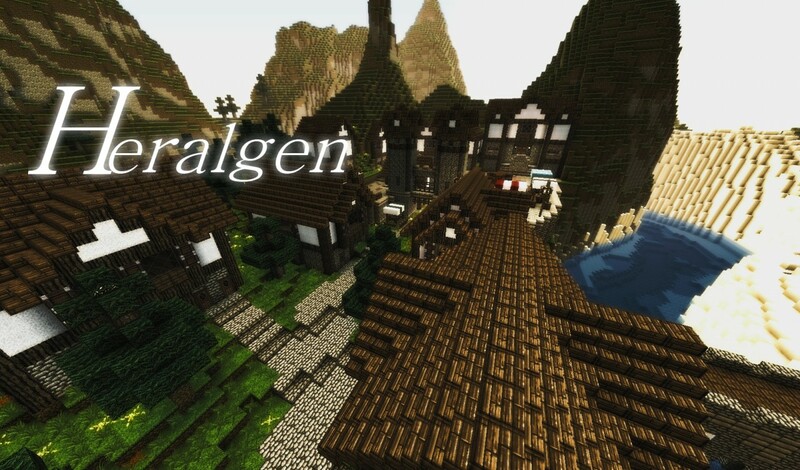 This was originally the Megabuild world for my old server, Heavenlymc. But now I am reforging it to be an adventure for singleplayer, and possibly multiplayer.. The whole adventure area of the world will be completely terraformed to look unique. The map will be unique compared to most other RPG type maps. It will be alot more open world, with a main quest line, but also side quest lines, such as guild quests, citizen quests and more. There will be a banking system with ender chests, dungeons around the world you can explore for treasure, and much more in this open world RPG adventure. The area will have different zones, with zone names. 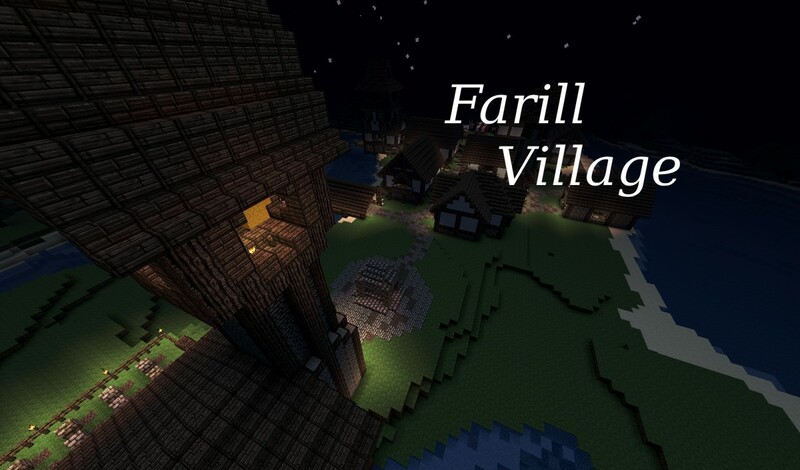 The adventure map file will also come with a world map with bordered zones and city locations. Freelands (Not complete): This is the heart, and centre of Moriela. It will be where you first head off into your adventure. Small villages inhabit these lands, aswell as the sanctuary of Mythrilin. Canvil Wastes (Not complete): A barren waste land, but home to the worlds largest gold mine. Morgnorn (Not complete): The land of the Dwarves. It is the largest mining zone in all of Moriela. Mistfall Woods (Not complete): Dark and mysterious, a strange feeling inhabits these lands. Norlaisia (Not complete): Hosts the tallest mountians in all of Moriela, and the Nordic city of Jarlvek. 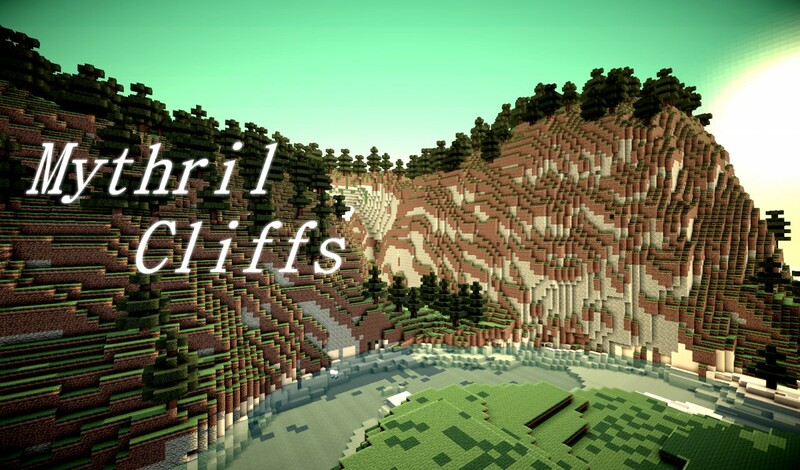 Mythril Cliffs (Not complete): The cliffs are a wonder to those who see it. Towns and villages sit attop the cliffs, aswell as at the bottom. Ahrk'zahj Dunes (Not complete): These lands of some of the most ancient history in all of Moriela. Great riches can be found here. Lythwynn (Not complete): The Land of the elves. 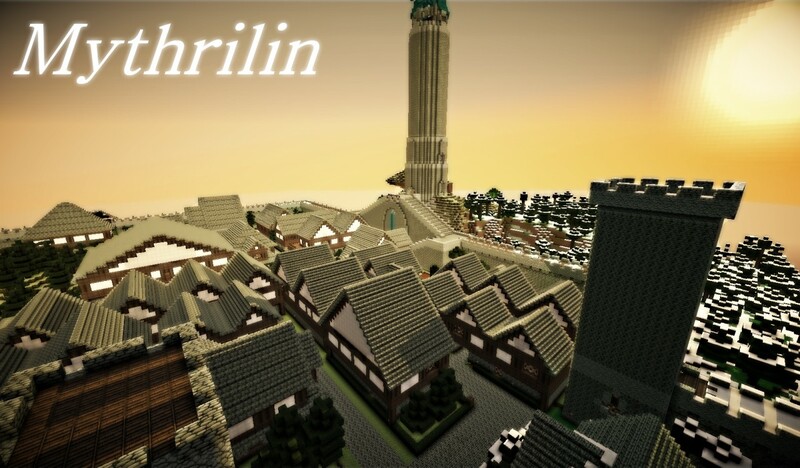 Lythwynn as a zone is basicly the whole city. The elven people all like to be very connected to each other. The Bog (Not complete): Small encampments of the knights lay around the bog, as it is the main way into Ardenar. 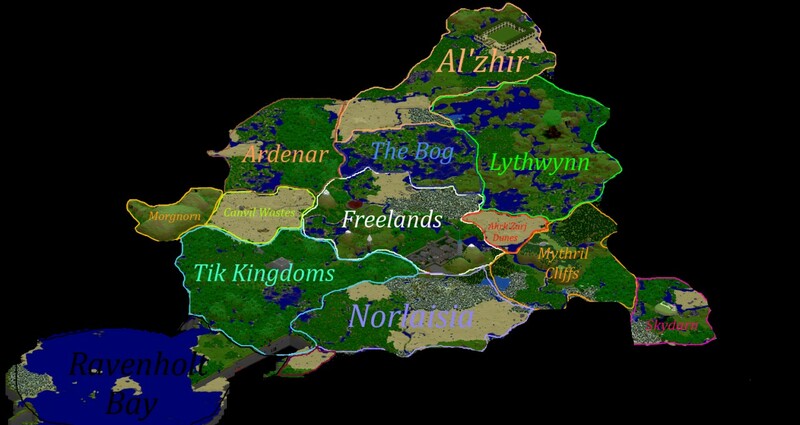 Al'Zhir (Not complete): The lands of al'zhir is the jewel of Moriela. You can expect very fine detail from this land. Ardenar (Not complete): The royal, and noble lands of Ardenar are home to the Knights of the city of Renaviel. Ravenholt (Not complete): The dark gloomy port city of Ravenholt. Mistfall Pass (Not complete): The smallest area in Moriela. But the most dangerous. The Kingdom of Moriela is a strange place. Full of different areas and challenges, peoples and communities. You are whoever you choose to be in this adventure, but you are a citizen of Mythrilin. Your past is your own tale, but now you must test yourself in a grand adventure. The gods of the heavens have abandoned the world, which has broken the peace across the lands. The dreaded myths and stories of the nether have now come true, and the demons have began appearing in our world. It is your duty now, to find a way to protect your world. your home. and your people. There is an underground vault underneath the tower of Mythrilin, locked by sets of levers. 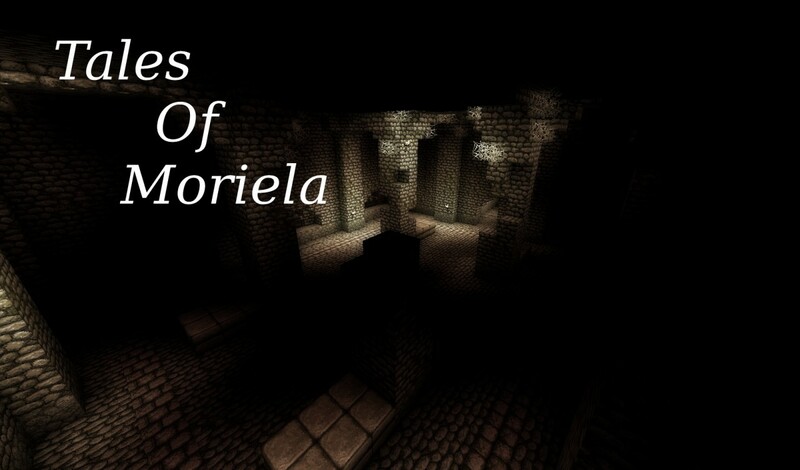 The levers are extreamly dangerous if you attempt to open the door at random, so you must head to the 5 different cities of Moriela to gain infomation on how to open this grand door. 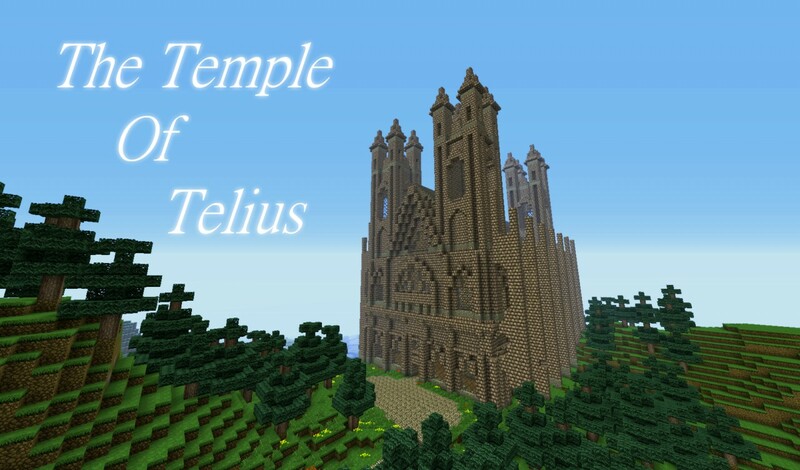 Inside, will be the dark swirling portal to the nether, which will bring you to your final, and most important task. If you want to help with this map, You can link me to your profile if you have any building designs I may use in my map! I plan on making episodes though stemming off of the current storyline. I do want to finish the story, but in different parts and worlds! Leoped, i know you aren't working on this anymore, so i'm building alot on it myself, but i'm not letting it out in public, it stays in my singleplayer world list, i'm almost done with Ravenholt, and mistfall woods and pass aren't located on the map so i just guessed it was the small purple area below Tik' Kingdoms. There you go, another diamond! Hey, I currently am no longer working on this map! I do really want to move the story over and start it again, and make it better and more high quality, but it's just finding the time and patience to do that, really. And also, where is Mistfall woods and Mistfall pass located really? They're not shown on the map. There's no information here about Skydarn, could you tell me a bit about it? I am thinking about it ALOT At the moment, and I want to do a full restart of it to be honest. completely revamp it but keep the story line. Hello! Not sure if you remember me by any chance, how is the map coming along? I recognize the name :). The map is coming along alright at the moment, but still a while to go. Can I use it like for non adventure map? What difficulty do I use? LAN Servers are fine. I'm not to happy about public servers, in case they claim it as there map. But if it's for LAN. Then sure. I'm not exactly happy about you using my map for your server... that's not why I made it. Hey dude, I cannot provide any help to you as for building, but what I can do is help you make your map more appealing to the public. What do I mean? I am offering to create a cinematic-story (a cinematic shot with a feel of a story behind it) of this map. All you will have to do is give it to me at a stage where its complete enough to be shot and the exact texture pack you want me to use to record it, and then just publish it here. Also if you want it to be ready when you publish it you might wanna give it to me before you actually publish the complete map. It would be amazing if you could do this for me! I need all the help I can get. I will message you in the near future of when I think it's suitable to shoot a cinematic. Also. Can you shoot it on servers? I can, yes. But I also wanted to maybe come up a with a few ideas as you are filming the cinematic. I guess I could come up with some ideas over the next few weeks and send them to you :). I'm sure we can arrange something :). he makes good cinematic's. [size=10pt] just look at my survival map (LINK)[/size]. Also if you still need help im free and could hop in. Im part of the creative node. And I also need building designs for areas. If I use your design you will get full credit :). seems you got a lot more attention on the map since i was last here good job! Comments like these inspire me to continue with what I love doing best. Thanks so much! And I am looking for helpers, yes. 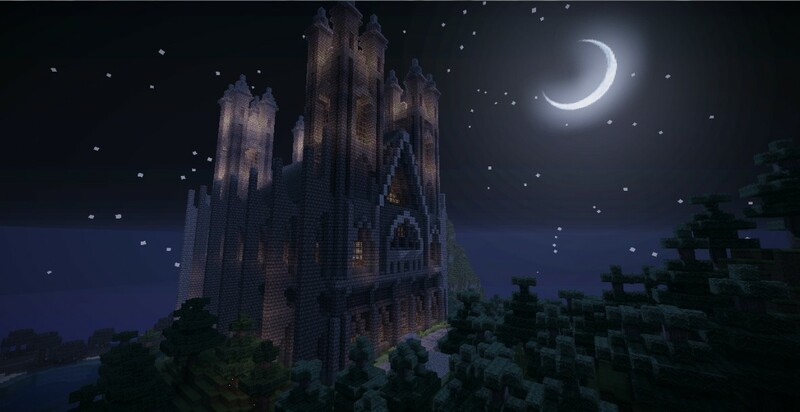 If you have any nice builds you've built then post them up on your planet minecraft page and il'l check them out :)! If you played through the demo, please leave a comment on what you thought about it :). This needs to get more attention! Looking really good! I'd be happy to help with any building you need, I'm a member of the VoxelBox, and I make music too. Hey, it sure is me :P! i could help to make a special texture pack for this level! if you need me to just pm me. 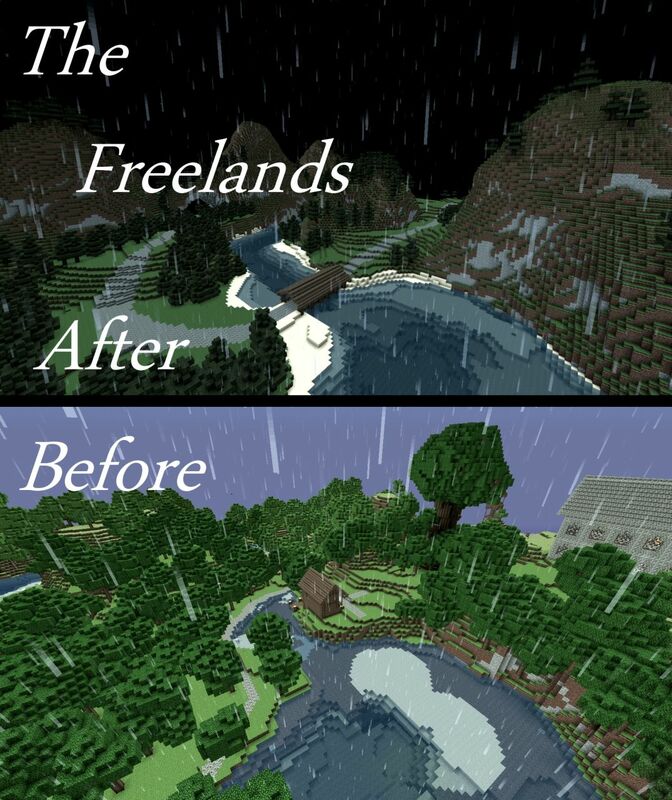 Thanks for the offer but as this is my first adventure map, i'd like to keep things very vanilla. I'm keeping redstone very simple for now as it's my first map. I just need things like design ideas for my cities and villages. Thanks for the offer though! maybe check out my work too? 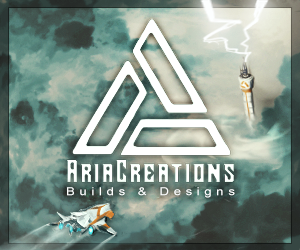 Do you do any fantasy style builds?